Jojoba oil is extracted from the seed of a shrub that grows in the US. Why is jojoba oils highly beneficial for skin and hair? Mainly because, it contains all the vitamins and elements required for healthy skin and hair. Even though it is called jojoba “oil”, its actually a waxy substance, hence doesn’t feel greasy on your skin and hair. Jojoba oil benefits your skin and hair in numerous ways. How jojoba oil benefits your skin? Since jojoba oil is a waxy substance, it mimics the sebum that your skin secretes. Washing with soap, or even plain water can strip the protective layer of sebum from our skin. Similarly if it is very cold out there, your skin could be dehydrated and can break. Which is why you need a moisturizer. If you are using a homemade moisturizer like me, add a few drops of jojoba oil to the mix (once the ingredients have cooled down – check out the recipe here). Or you could use jojoba oil as is, as a moisturizer. Just add a few drops to your palm and apply the oil to your face with your fingers. Doing this at night helps moisturize and repair your skin. Acne is one of the most common skin problems that can scare us. Jojoba oil helps fight acne in two ways. First – It unclogs your pores, thus removes the possibility of the occurrence of acne altogether. If you’re wondering what clogs your pores, this post might surprise you! Second – it is antibacterial. Hence it helps clear any infection or possible causes of infection and keeps your skin clear. Jojoba oil is well known for its soothing action. If you have sunburn or affected skin due to extended sun exposure, just dab a couple drops of jojoba oil in the affected area. In 2-3 days you should see the result. Of course, using a homemade sunscreen lotion will help avoid sunburn. Got dry and cracked feet? One of the main reasons for the occurrence of cracked feet is the lack of moisture in your feet. This is why you need to moisturize your feet regularly in order to avoid cracked feet. Before bed, just apply 2-3 drops of jojoba oil on your feet, put on a socks and enjoy smooth crack-free feet! Just like cracked feet, dry cuticles are a great problem. They not only make your hands look ugly, but they can also be painful. It is better to prevent than cure a damaged cuticle. You can use jojoba oil as a regular at home manicure and/or pedicure. After shower, apply couple of drops of jojoba oil over your cuticles. You can also soak your nails in warm water for about 10 minutes and then apply the oil for better absorption. If you have lost a lot of weight, stretch marks are an unwanted byproduct. Similarly, if you have just delivered, you might have some of those marks over your tummy! Jojoba oil is very effective in making stretch marks disappear. Since jojoba oil is rich in vitamin E, regular application of the oil over the stretch marks (and even scars) will make them disappear quite fast! Jojoba oil is rich in anti-oxidants. Hence it helps diminish wrinkles and fine lines. Before bed, dab a few drops of jojoba oil over your face. Focus on the areas around your eyes, cheeks and temple to get a youthful glow. Since jojoba oil is anti bacterial and anti fungal, it can help you with fungal infections. If you have fungal infections in your feet, apply jojoba oil in the affected area and leave it open. So far we have seen the uses of jojoba oil for skin. It doesn’t end there. 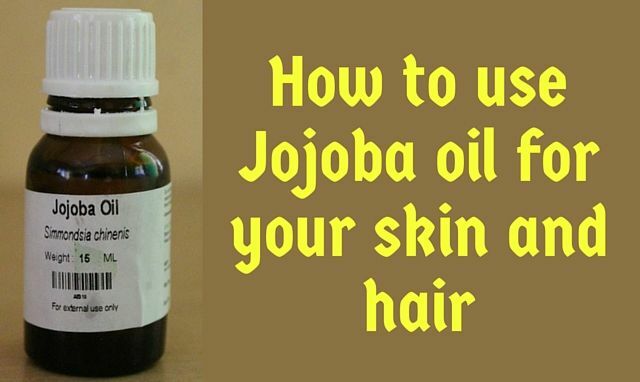 Jojoba oil is great for your hair as well. Here are the uses of jojoba oil for your hair! Yes, jojoba oil conditions your hair pretty well. It works great as a leave in conditioner. After you have towel dried your hair, rub 2-3 drops of jojoba oil between your palms and apply to your hair. Jojoba oil acts as a wonderful conditioner and adds shine to your hair. Jojoba oil helps promote hair growth by unclogging your hair follicles, thus enabling smooth growth of hair. Often, product build up or even dirt can block your hair follicles, thus hindering hair growth. Jojoba oil penetrates your follicles and clears the build up. It is also rich in vitamins essential for hair growth. Dandruff is caused by dryness in the scalp causing the scalp cells to die off sooner than usual. The anti-dandruff shampoos that we use to treat dandruff have zinc and selenium, while jojoba oil is naturally rich in these minerals. Applying a few drops of jojoba oil on your scalp helps to control dandruff. Is your hair too frizzy to manage? Jojoba oil can certainly help you with this! After washing your hair, towel dry it. Then rub a few drops of jojoba oil between your hands and run your fingers through your hair. Now you will be easily able to tame your hair. Just like taming frizz, jojoba oil also helps with detangling your hair. The super knots or the curls can sometimes become too annoying when you want to style your hair. Especially, at times when you are hurry, this can become quite a problem and lead to hair loss. Applying a few drops of jojoba oil to your hair makes it quite easy to detangle. To summarise, jojoba oil is an essential element in your skin and hair care routine. You can get jojoba oil here or here. Don’t miss out on this wonderful beauty oil! I had no idea it was an antibacterial or that it fought acne… I often use it on my hair, it.s great! Thanks for your tips! You are welcome Florentina 🙂 Thanks for stopping by!